follow the instructions for uploading to the European Railway Picture Gallery: Look here! send me a mail at tbk@uncia.de - not at the outdated address which is still on some older pictures - and tell me of your upload. I would also be happy about any additional blank drawings, especially of European rolling stock! 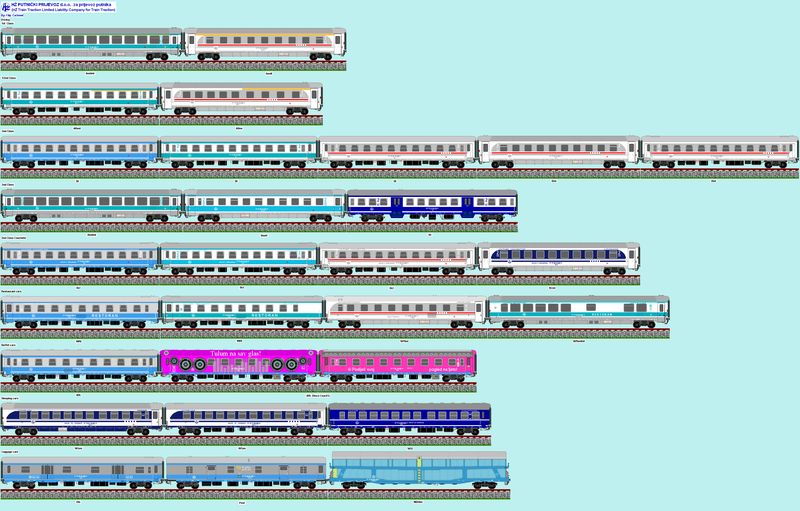 These are attempts to demonstrate all liveries of a given railway on small "example vehicles", such as a Locomotive 2000, a MaK diesel locomotive, and a 26.4 m passenger car, all drawn slightly simplified and at a scale of 6 pixels per meter. New! These pages now work like the "European Railway Picture Gallery". I have created a short text file describing each picture. For some pictures I was unable to find out the author - please contact me if you made these pictures and would like to be mentioned! Not just the locomotive as we know it from Switzerland, Norway, Finland and Hong Kong, but also some interesting (or crazy?) modifications. Scale: 32 pixels per meter. Undecorated drawing - use it for your own designs! A more "classic" shaped electric locomotive for your colouring experiments. 32 pixels/m. Including the ES64U2 (ÖBB 1116/Taurus). 32 pixels/m. A number of different ICE versions in a smaller scale (10 pixels/m). The diesel prototype and some electric derivations. 32 pixels/m. Based on drawings by Stan Lytle and others. The origin of it all: an unofficial painting contest for the BNSF; my blue/green livery won the second prize. Class 215, derived from the V160, built by Keupp and other companies. Vossloh G1700BB and G2000 dieselhydraulic locomotives. Romanian locomotives class 40/41 and similar types. Romanian locomotives class 60/62 and similar types. Various diesel railcars by Fiat. EMUs operated by HZ and others. EMUs in Poland and ex-Yugoslavia. Diesel trains built by Macosa (Croatia etc.). Tilting DMUs in Germany and Croatia. Uerdinger railbus and related units. Everything not directly based on a real locomotive. 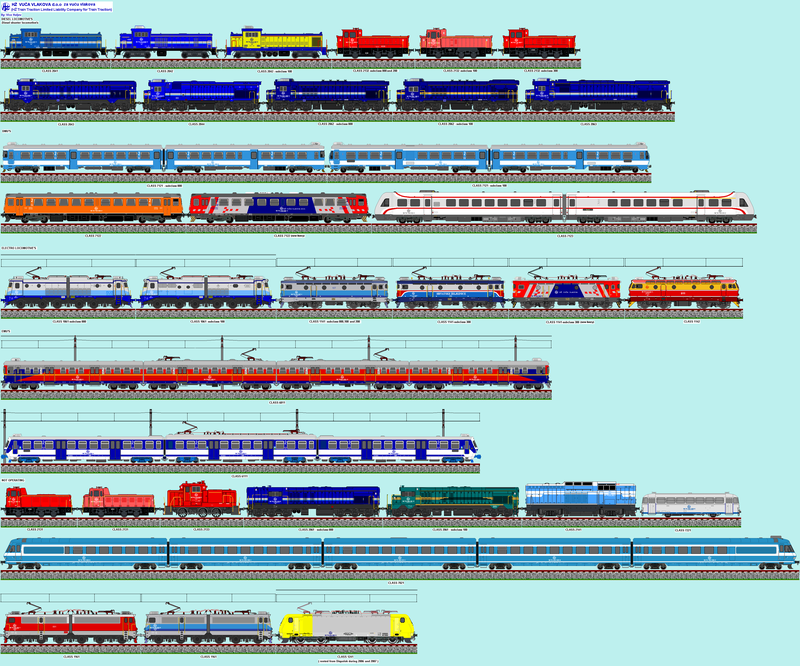 Colourings of real locomotives not fitting into any other category. Proposals for the livery of the future high speed railway in Taiwan. PCC Based on drawings by Jacques Bélanger. The north American PCC trams inspired numerous trams around the world. Plus other types of trams, by Filip Čaćković. Based on SGP cars for Austria and Greece (and some north American cars drawn by Richard Wilson-Shea). Various freight cars of European origins. For more North American liveries of the Locomotive 2000 look here at www.nscalecorner.railfan.net. If you enjoy colouring locomotives, don't forget visiting The Railroad Paint Shop!